Dr. Cho emphasized, "Jesus is the only Savior of our life." 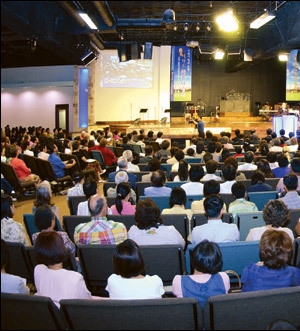 To the Korean residents in Dallas, Dr. Cho emphasized their true identity in Jesus Christ. They promised to live as light and salt in their community, recovering their identity in Jesus Christ. The meeting was organized by Full Gospel North American Council and coordinated by David Cho Evangelistic Mission (DCEM). Two thousand Korean residents and 1,500 North Church members gathered to pray and praise God. The North American Mission Team presented a special performance of worship and praise at North Church. Senior Pastor Rev. Lawrence Kennedy gave a welcome speech, and the choir of North Church sang praises unto the Lord. 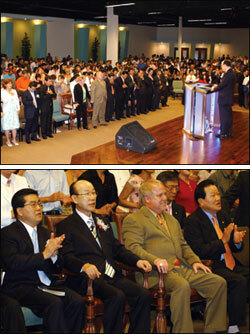 It was a meaningful time for Korean and American residents to experience unity in Christ. Before Dr. Cho큦 message, Rev. Kennedy welcomed Dr. Cho by saying, "It is a great privilege to have Dr. Cho and Korean people in our North Church. We thank God for leading Dr. Cho to this place. I first met him ten years ago in Korea, and I have planted North Church through his encouragement and prayer. " After Rev. Kennedy큦 welcome, Dr. Cho preached on "Threefold Blessings," based on Exodus 15:22-27. He pointed out three concerns of Moses while leading the Israelites across the desert: (1) suffering from circumstances, (2) suffering from sickness, and (3) suffering due to the necessities of life (food, clothing, and shelter). He said, "Jesus is the good God who has already solved all this suffering and calamity by dying on the Cross 2,000 years ago." Dr. Cho told the story about the Israelites crossing the Desert of Shur, arriving at Marah to drink the bitter water. Moses cried out to God, and He showed him a piece of wood. Moses threw it into the water, and the water became sweet. Dr. Cho said, "The wood that made the bitter water sweet is a symbol of the Cross, and the Cross of Jesus Christ is the Cross of salvation that can change a bitter life into a sweet life." Dr. Cho emphasized, "I hope that none of you will keep drinking the bitter water of suffering, but will taste the goodness and power of the Cross by totally depending upon Jesus Christ." "Jesus is the healing God who eagerly wants us to be healed from sickness," said Dr. Cho. Then he prayed for healing of the sick and for the health of the 3,500 attendees. 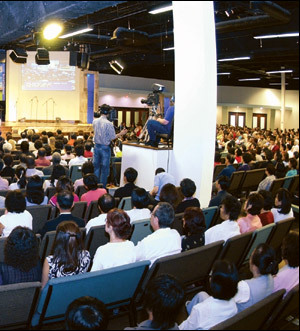 The revival service with Dr. Cho was prepared for Korean residents in Dallas. However, many of the North Church members and other Americans were blessed to hear Dr. Cho큦 message with English interpretation on the screen. The service was a joyous time-overflowing with God큦 grace. The North American Mission Team under Full Gospel Businessmen큦 Federation and North Church (Rev. Lawrence Kennedy) gave great support to the success of the revival service.